A few years ago I read The First American: The Life and Times of Benjamin Franklin . It’s a lengthy biography but well worth the read. So when I saw a free version of the Benjamin Franklin autobiography from Amazon available for the Kindle, I downloaded it immediately. This past week I’ve been reading the autobiography and have been equally impressed, if not more from the biography. Benjamin Franklin was a man from a basic and humble family upbringing that worked hard for his accomplishments. He was above all a thinker and a practical man. His autobiography is full of wisdom, advice, and ideas. One tool that he had at his disposal was a printing press. He used the printing press to distribute ideas and teachings to a greater audience. He wanted his writings to create a dialogue with others, to state a point, to create relationships. Does this sounds familiar? It’s very similar to today’s blogger. As I read about how he used the printing press and what he printed I couldn’t help but think that this was the first American blogger. He used two types of publications that are synonymous with blogging . The first was a newspaper with articles from himself as well as others that would pay to be printed. The second type of printing more closely analogous with blogging were pamphlets. These publications were on a single topic much like a blog post. Mr. Franklin had rules about what he would print. He indicates that he would exclude “all libelling and personal abuse” because he felt obligated to provide his subscribers with something useful or entertaining. He would print such items separately if the author wished to distribute them via their own methods. His words on this topic are written in the form of advice and good business sense. To increase the availability of his writings to a broader audience, Benjamin Franklin didn’t have Google or RSS feeds. However, he did gain a position at the post office. I….found it of great advantage; for, tho’ the salary was small, it facilitated the correspondence that improv’d my newspaper, increas’ d the number of demanded, as well as the advertisements to be inserted, so that it came to afford me a considerable income. Plain Truth – He discussed the need for his city to have a disciplined militia for the defense of the city. An Account of the new-invented Pennsylvania Fireplaces – He discussed his invention of an open stove for the better warming of rooms while at the same time saving fuel (the first energy star appliance). Proposals Relating to the Education of Youth in Pennsylvania – He discusses how to establish and operate an academic academy for youth. 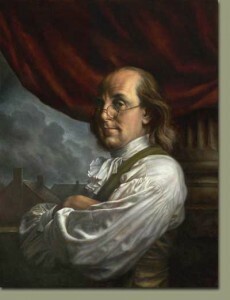 Benjamin Franklin is listed in our history books as the first man to do or create many things. If he lived in 2010, I believe he would be a prolific blogger. I salute you Benjamin Franklin, the first American blogger.